Filmmaking (or in an academic context, film production) is the process of making a film. Filmmaking involves a number of discrete stages including an initial story, idea, or commission, through screenwriting, casting, shooting, sound recording and reproduction, editing, and screening the finished product before an audience that may result in a film release and exhibition. Filmmaking takes place in many places around the world in a range of economic, social, and political contexts, and using a variety of technologies and cinematic techniques. Typically, it involves a large number of people, and can take from a few months to several years to complete. Development: The first stage in which the ideas for the film are created, rights to books/plays are bought etc., and the screenplay is written. Financing for the project has to be sought and greenlit. Pre-production: Preparations are made for the shoot, in which cast and film crew are hired, locations are selected, and sets are built. 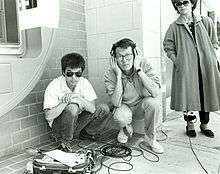 Production: The raw elements for the film are recorded during the film shoot. Post-production: The images, sound, and visual effects of the recorded film are edited. Distribution: The finished film is distributed and screened in cinemas and released to home video. Next, a screenwriter writes a screenplay over a period of several months. The screenwriter may rewrite it several times to improve dramatization, clarity, structure, characters, dialogue, and overall style. However, producers often skip the previous steps and develop submitted screenplays which investors, studios, and other interested parties assess through a process called script coverage. A film distributor may be contacted at an early stage to assess the likely market and potential financial success of the film. Hollywood distributors adopt a hard-headed business approach and consider factors such as the film genre, the target audience and assumpted audience, the historical success of similar films, the actors who might appear in the film, and potential directors. All these factors imply a certain appeal of the film to a possible audience. Not all films make a profit from the theatrical release alone, so film companies take DVD sales and worldwide distribution rights into account. 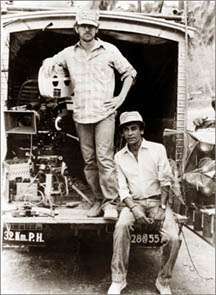 Steven Spielberg with Chandran Rutnam in Sri Lanka, during the production of "Indiana Jones and the Temple of Doom" which was released in 1984. In production, the video production/film is created and shot. More crew will be recruited at this stage, such as the property master, script supervisor, assistant directors, stills photographer, picture editor, and sound editors. These are just the most common roles in filmmaking; the production office will be free to create any unique blend of roles to suit the various responsibilities possible during the production of a film. Here the video/film is assembled by the video/film editor. The shot film material is edited. The production sound (dialogue) is also edited; music tracks and songs are composed and recorded if a film is sought to have a score; sound effects are designed and recorded. Any computer-graphic visual effects are digitally added. Finally, all sound elements are mixed into "stems", which are then married to picture, and the film is fully completed ("locked"). This is the final stage, where the film is released to cinemas or, occasionally, directly to consumer media (DVD, VCD, VHS, Blu-ray) or direct download from a digital media provider. The film is duplicated as required (either onto film or hard disk drives) and distributed to cinemas for exhibition (screening). Press kits, posters, and other advertising materials are published, and the film is advertised and promoted. A B-roll clip may be released to the press based on raw footage shot for a "making of" documentary, which may include making-of clips as well as on-set interviews. Since the advent of home video in the early 1980s, most major films have followed a pattern of having several distinct release windows. A film may first be released to a few select cinemas, or if it tests well enough, may go directly into wide release. Next, it is released, normally at different times several weeks (or months) apart, into different market segments like rental, retail, pay-per-view, in-flight entertainment, cable, satellite, or free-to-air broadcast television. The distribution rights for the film are also usually sold for worldwide distribution. The distributor and the production company share profits. Filmmaking also takes place outside of the mainstream and is commonly called independent filmmaking. Since the introduction of DV technology, the means of production have become more democratized. Filmmakers can conceivably shoot and edit a film, create and edit the sound and music, and mix the final cut on a home computer. However, while the means of production may be democratized, financing, traditional distribution, and marketing remain difficult to accomplish outside the traditional system. In the past, most independent filmmakers have relied on film festivals (such as Sundance, Venice, Cannes and Toronto film festivals) to get their films noticed and sold for distribution and production. However, the Internet has allowed for relatively inexpensive distribution of independent films on websites such as YouTube. As a result, several companies have emerged to assist filmmakers in getting independent movies seen and sold via mainstream internet marketplaces, often adjacent to popular Hollywood titles. With internet movie distribution, independent filmmakers who fail to garner a traditional distribution deal now have the ability to reach global audiences. ↑ Steiff, Josef (2005). The Complete Idiot's Guide to Independent Filmmaking. Alpha Books. pp. 26–28.